The end goal of the patient build the 76ers have undertaken the last five seasons is championships, in the plural, not singular sense. Only time will tell how much more work needs to be done until they ultimately get to that point, but one thing became fact Sunday afternoon - this year’s breakout edition of the club can now lay claim to championship company, from its own lineage, too. Knocking off the Dallas Mavericks 109-97 at The Center, the Sixers won their 14th consecutive game. 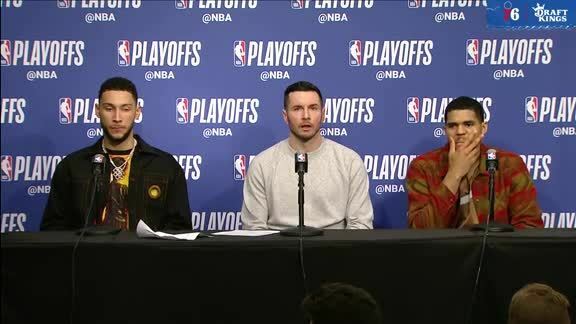 The streak matches an in-season franchise record originally established by Julius Erving, Moses Malone, Mo Cheeks, and the rest of the Sixers’ 1982-1983 title team. Also achieved Sunday was something arguably more important and immediate. The win, the Sixers’ 50th of the year, guaranteed that they’ll finish the regular season no worse than fourth place in the Eastern Conference, meaning they’ll have home court advantage for at least the opening round of the playoffs, which begin next weekend. And Brown has had a hand in every bit of the Sixers’ success, resiliently guiding the team forward despite having to endure stretches of considerable adversity. More so than any of Brown’s previous four years at the helm, this season, the Sixers have benefited from an influx of talent and depth. That factor, combined with the heart, hustle, and grit that Brown began demanding of his first group back in 2013-2014, has taken the team to new heights. As has been the case over the course of their current late-season surge, the Sixers Sunday again received valuable contributions from across the roster. Simmons racked up 16 points (7-10 fg), 7 rebounds, 9 assists, and 4 steals. For a fourth game in a row, JJ Redick paced the Sixers in scoring, with 18 points (6-14 fg, 2-6 3fg). Ersan Ilyasova provided key contributions off the bench, registering his fourth straight double-double with 11 points and 12 rebounds. His second half efforts were particularly crucial to Sunday’s outcome. After the weekend matinee got off to a ragged start, the Sixers began to find their stride late in the first quarter. Back-to-back jumpers from Redick - first a two, then a three - gave the Sixers modest breathing room, at 28-20, through 12 minutes of play. At the midway point of Sunday’s second frame, the Sixers seized control, doing so behind their rookie phenom. With the Sixers’ lead at two, Simmons subbed in, and proceeded to find a favorite target in Covington. Simmons assisted on three consecutive Covington baskets, then provided an emphatic jam to cap a game-changing 14-0 run. The blitz was part of a burst in which the Sixers outscored Dallas 19-2, and opened up a 19-point margin. The Sixers’ advantage stood at 61-48 at intermission. With talented wingman Harrison Barnes leading the charge, the Mavs put some pressure on the Sixers in the second half. In the latter stages of the third quarter, the margin had dwindled to four points, 80-76. 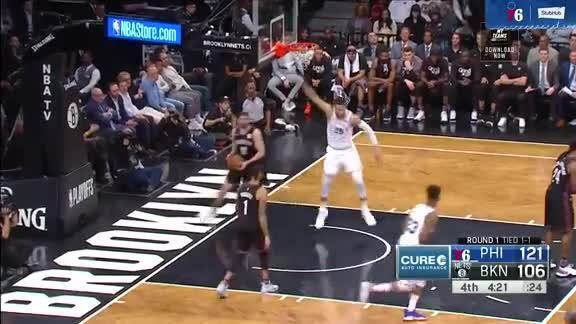 Ilyasova, however, proved to be a steadying presence, tallying seven of the Sixers’ next nine points to set the tone for the fourth quarter. 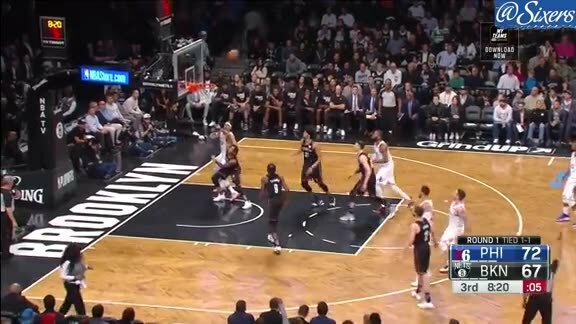 The spurt triggered a pivotal 15-2 that Simmons punctuated with a driving lay-up. The Sixers would lead by as much as 20 before the end of the afternoon. 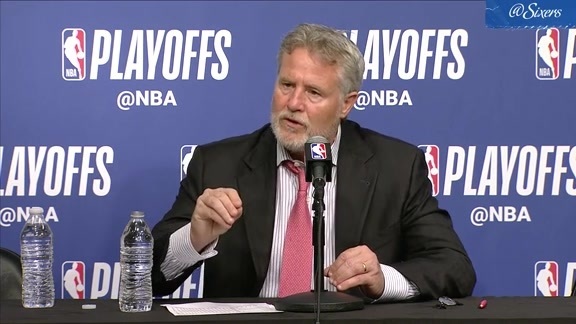 As Brett Brown said, the Sixers’ success this season has been “exceptional.” It’s a tag that would be appropriate for just about any 50-win campaign, let alone one earned by a team that won one-fifth of that total two years ago. Reflecting on the distinguishing traits of the 2017-2018 Sixers, Brett Brown said one characteristic stands out more than anything else. “There is a toughness in our group,” said Brown. He attributes this to the defense the Sixers play. On top of that, Brown feels that a team-first attitude is part of the Sixers’ identity. The evidence, he said, can be found in the Sixers’ passing prowess. Sunday’s victory over Dallas moved the Sixers’ home record to 29-11, tied with Cleveland for second-best in the Eastern Conference. Only Toronto, at 33-7, has been better on its home turf. Given how raucous and supportive the South Philadelphia crowds have been this season, the Sixers made securing home court advantage for the first round of the playoffs a top priority. The Sixers have won all but one of their last 21 games at home, and have sold out every game at The Center this season. Against Dallas, Markelle Fultz logged 21 minutes, his highest total since returning to action eight games ago. Brett Brown has wanted to use the final days of the season to get a better sense of what Fultz can do in a live setting, so that the 2017 no. 1 pick got a lion’s share of Sunday’s back-up point guard minutes was no surprise. He even had one brief stint playing alongside Ben Simmons. Fultz realizes he can gain a lot by playing more. Fultz posted 4 points (4-11 fg), 2 rebounds, and 3 assists versus the Mavs. He’s also able to combine - in uncanny fashion - exceptional footwork, impressive strength, and a soft touch, all qualities that were on display during this multifaceted first quarter scoringn sequence. Throughout the day, Simmons managed to exert his will on the interior. For their last road outing of the regular season, the Sixers will pay another visit to the Atlanta Hawks. The Sixers were just in the Peachtree State two weeks ago, picking up a 101-91 triumph over Atlanta on March 30th. Back at Phillips Arena on Tuesday, the Sixers will also start their 14th and final back-to-back set of the year. They’ll host the Milwaukee Bucks Wednesday at The Center in the regular season finale.